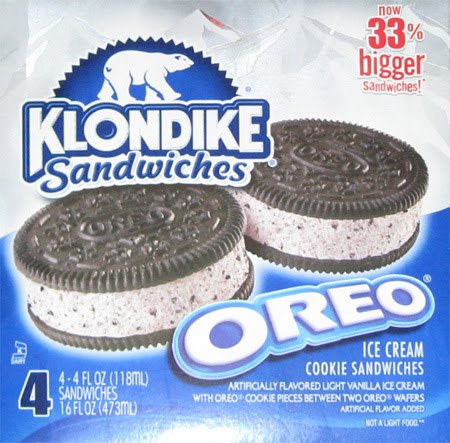 someone called out the fact that new Klondike Oreo Ice Cream Sandwiches have been modified since their humble beginnings as Breyers Oreo Ice Cream Sandwiches. I went back into my archives and sure enough these treats have changed. Hmmm, sounds like it's time to "force" myself to eat some ice cream sandwiches. Now 33% bigger! My math skills tell me that this use to be 3 fluid ounces. It's gotta look like an exact replica if it wants to taste right! i take my first bite and I am overwhelmed with the Oreo goodness provided by the giant wafers. I take a few more bites, and while very tasty, my mouth is quickly becoming very dry. 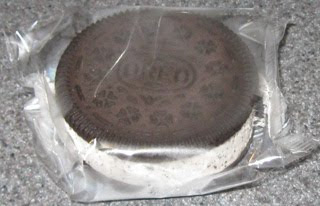 The new oreo ice cream filling is a vast improvement over the old stuff, but unfortunately, the ice cream layer is thinner then it use to be and it's not providing nearly enough balance (well, not that the old one did either). I press on because the Oreo Wafer sare wonderful, but I keep craving more ice cream. I try to take a bite of the ice cream that has squeezed out the back, but the small break isn't big enough to recover form this treat. Treats like this are hard to review because on the one hand, they are wonderful, but on the other hand, they frustrate you immensely. I quickly polished off my treat and found it difficult not to go running back to the box for another. Sure I'm thirsty and in need of a glass of chocolate milk, but like an good Oreo, I want more! On Second Scoop: I haven't even posted yet but here I am already having my second one (don't worry, it's a new day, so it's all good). Mmmm, my hope is that it wouldn't strike me as dry as it did yesterday. Let's find out! Mmmm, certainly smells good. It certainly is tasty. I should have eaten with my left hand so I could type easier. Still dry, but still very tasty. How sad, it's all gone. It's got a nice strong Oreo aftertaste. I thought yesterday might be a fluke, or maybe the freezer is a little off, but this ice cream is so soft that the whole sandwich squishes and a bit comes out the back. Not a huge deal, just thought I would mention it. Closing thoughts: I hate to say it, but these are all gone and I'm a little sad. It's weird how they strike you as less dry with every try, but hey, I can live with that. I'm sure the next box will taste even better. Comparing fat to fat, I'd take one of these over a pair of skinny cows any day. On Third Scoop: Well, it's been a month and I finally remembered to pick up a fresh box of these. Mmmmm, so crunchy. Mmmmm, so Oreo-y. Mmmmmm, I think I need to wash it down with some chocolate milk. 2011 Update: I have bought many boxes of these. They are tasty. 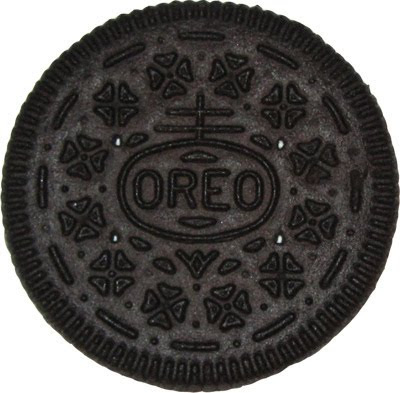 I love how strongly Oreo they are. They are also pretty filling which works out since having just one isn't that bad for you. If you like Oreos, you should have a box of these in the fridge (I do). I've had these since they've become part of the Klondike line. They definitely get my approval, I think their one of the better lower cal options and they beat the pants off of breyers current cookie sandwiches.